I found this image a long time ago and I saved it. It’s supposed to depict a Sassanid disk. I have not since been able to find any more information about it; the image is on a few sites without anything specific about its origin. The original site it appeared on has long disappeared from the net. The Sassanid dynasty ruled in Persia from 224 to 651 AD, from their capital Ctesiphon, on the river Tigris. Theirs was a huge Empire and their religion was Zoroastrianism, which attributed divine qualities to the dog – so they were very fond of their hounds. I recommend reading this post while listening to the appropriate music, by the way: Thus spoke Zarathustra…”Four kinds of Persian hunting hounds were reported by the classical authors: Elymaeans from the northeastern shore of the Persian Gulf; Hyrcanians and Carmanians, known for their savagery; and Medians, which were great fighters (Aelian, 3.2, 7.38; Grattius; Pollux, Onomasticon; cf. Hull, pp. 26-29). Aside from Zoroastrian funerary rites, pre-Islamic Persians used the dog not only for hunting and herding but also in war (Fiennes, pp. 28-29; cf. Aelian, 7.38). Persians, Greeks, Assyrians, and Babylonians used large mastiffs as shock troops; […] Indian dogs were highly prized among the Persian aristocracy; Xerxes I (486-65 B.C.E.) reportedly took a large number of them with his army when he marched against Greece (Herodotus, 7.187). One of the Persian satraps of Babylon assigned the revenues derived from four large villages in that province to the care of his Indian hounds (Herodotus, 1.192). A dog belonging to Darius III (336-30 B.C.E) supposedly refused to leave his corpse after he had been struck down by Bessus (q.v. ; Aelian, 6.25, 7.10). Dogfights must also have been common in ancient Persia (Grattius, apud Fiennes, p. 11). Alexander the Great was said to have received a gift of four fighting dogs from Indians (Aelian, 8.1). The Persian phrase sag-e kārzārī (war dog) may refer either to canine warriors or merely to dogs trained for dogfights (Šāh-nāma,Moscow, III, p. 166)”. [See Encyclopaedia Iranica online]. 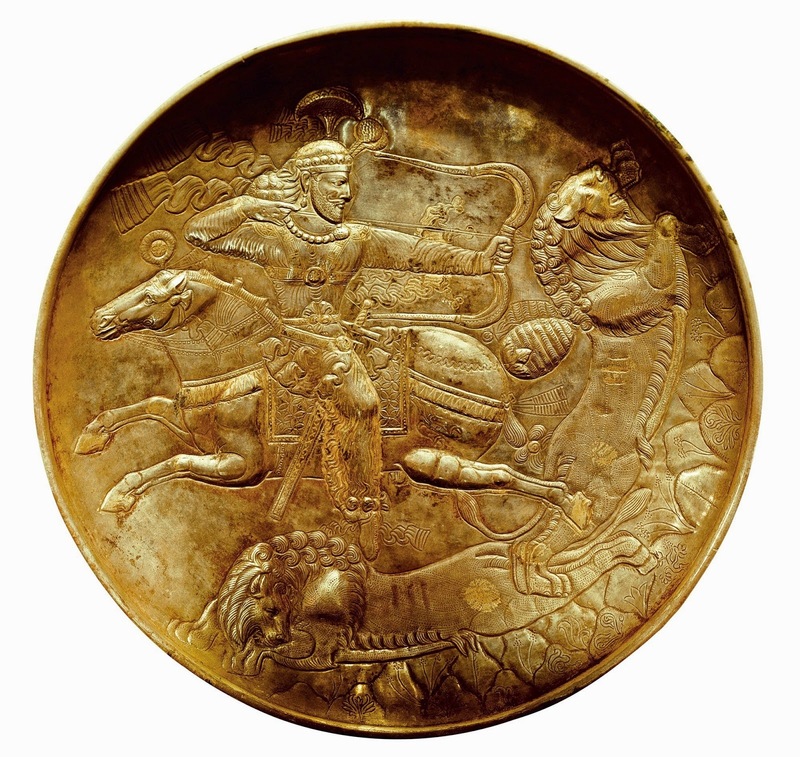 It is said that King Khosrow (Chosroes) II, the last great king of the Sassanid Empire, who reigned from 590 to 628, went hunting with 300 horses, 1160 slaves with javelins, 1040 slaves with swords and staves, 700 falconers, 300 riders with hunting panthers, 70 leopards, 700 hounds and 200 minstrels; such scenes are beautifully depicted on rock carvings (reliefs) at Taq-e Bostan, in the heart of the Zagros mountains in western Iran. (Iran, by Patricia Baker & Hilary Smith, 2001). The Sassanids also loved story-telling: the original base of the “One Thousand and One Nights” was apparently a Persian book called “A Thousand Stories”. Rostam Farrokhzād, Persian general who served kings Boran (631 – 632) and Yazdegerd III (632-651), the two last Sassanid kings, became a legendary hero and his adventures are immortalized in the epic poem Shahnameh. In 636, the king ordered Rostam to attack the Muslim Arabs invading Persia. Before the battle the Sassanid general sent a letter to the enemy, praising the greatness of his king and warning the Arabs that they were no match for him. In this we read: “His hounds, panthers and falcons number twelve thousand, all dight with golden bells and earrings”. (The Epic of the Kings). But all this might did not save the day: Rostam was killed by an accident and his army was demoralized and defeated. That was the beginning of the end for pre-Muslim Iran. I hope you enjoyed another journey on our time-machine, all the way back to the distant ancestors of our Danes !